The Orlita Evolution range with PVDF and PVC dosing heads meets the most stringent safety requirements for the capacity range 3 – 7,352 l/h at pressures up to 21 bar. 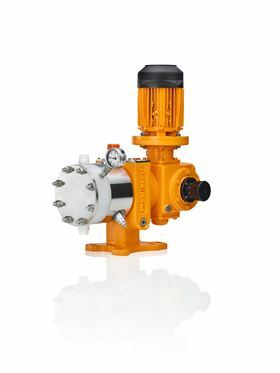 The extended range of the Orlita Evolution series of process pumps were part of the products presented by German liquid metering systems manufacturer, ProMinent, at the recent ACHEMA trade fair. The Evolution 1 to 4 ranges, previously only available with a stainless steel metering unit, can now also be fitted with metering units made of PVC and PVDF. This extends the potential applications of the pumps, particularly for applications with aggressive media. In addition to this, ProMinent has added the EP1 and EP2 piston metering pumps to their line of hydraulic diaphragm metering pumps. All Evolution versions with stainless steel and plastic metering units, as well as those with a piston dispensing head, have a modular structure. They can be flexibly designed as single-pump or multi-pump versions. With multi-pump systems, up to four metering units can be combined, including units with different delivery capacities. The special feature is the position-independent arrangement of the drives – with both vertical and horizontal installation possible. The pumps Orlita Evolution EP1 and EP2 enable precise pump capacities even at maximum pressure and temperatures of up to + 200 °C.